I recently came across a character study of John D. Rockefeller written more than a century ago by Ida Tarbell. At the time Rockefeller had amassed one of the largest personal fortunes in history by turning the Standard Oil company into a feared monopoly that patiently destroyed its competitors. Reading this piece I was struck by one of Rockefeller's early habits that led to his success–when he took his first job, as a clerk in a warehouse, he maintained a ledger book that tracked all of his expenses. And so "Ledger A" goes on with a painstaking record of every cent received and expended for a period of several years. Every cent earned could be accounted for, not a loose thread in his weaving, and one cannot help but feel that each particular penny was spent only after deliberation, and perhaps prayer. Rockefeller knew at every moment where he stood financially. Every dollar was accounted for and given a job. He made sure that his money was always working for him to generate more money. This put Rockefeller in a position to take advantage of the business opportunities that eventually came his way. Over the years I have developed poor financial habits. Being a student I have been used to living week-to-week without ever having a clear overview of my finances. Fortunately I never got into serious debt, but I have not been building my savings either. It has become clear that I need to take control of my finances and start budgeting. I considered a number of different options. One of the simplest is the envelope budget: put your money in a number of different envelopes each labeled with a particular budget category, like groceries, rent, utilities, and so on, and then only spend the money in that envelope. I know people who replicate the budget envelope system using a spread sheet. For a while I considered using a spread sheet, but this was too cumbersome for me. I would get lazy and stop using it. What I want is a program that is easy to keep up to date and has accountability built in. I looked at Mint.com, Quicken for Mac, MoneyWell, and iBank. Mint makes it easy to keep track of your transactions; because Mint scrapes your account1, it automates most of the entry tasks. There is very little in the way of budget options or accountability though. Mint lets you know what you are spending your money on, but this does not lead to a change in habits alone. I have tried similar systems in the past, but have failed. Knowing that my account data is being automatically downloaded and categorized provides a sense of accomplishment, but it does not stop me from overspending. There is no planning built in. Quicken for Mac is a disaster, and iBank works like a more sophisticated version of Mint. MoneyWell provides some budgeting options, but again there is very little in the way of accountability. What I wanted was a modern day version of Rockefeller's ledger: something that would allow me to easily enter my expenses, track my spending, and stick to a budget. A software program that would help me get my money working for me. The most important principle I have found is to give every dollar a job. When money comes in you manually assign it to a task. For example, our food budget is $400 per month. $400 of my salary each month is tasked with feeding my wife and I. This is simple, but it brings in accountability. At the beginning of each month you know exactly where each dollar will be spent. There is flexibility in the system too. If you overspend in one category you must take it from some place else. This could be another category with extra money left over or from your savings. YNAB allows you to download your account files from your online banking site, but I don't recommend doing this. The system works best when you manually enter in your transactions at the end of each day. It takes a couple of minutes longer, but keeps you accountable by forcing you to reconcile and review your budget. YNAB does have a steep learning curve, but also excellent online support. There are numerous videos that walk you through the program step-by-step. They also offer teleseminars and have an active forum. I strongly recommend following the tutorials when setting the program up; if you try to wing it you will most likely end up frustrated. I made this mistake when starting. The first thing I did was to import several months worth of transactions into the program and then categorize them. YNAB prefers that you start with a clean slate. You import your starting balances (any debt is categorized as "pre YNAB debt") and then assign the money you have available to your various budget categories. My wife and I use Dropbox to sync our budget file between our computers. This makes it easy for us to update and keep our budget current. To keep the budget file from becoming corrupted we have to make sure that only one of us is working on the file at a time. I wish YNAB would build in better Dropbox support to automatically resolve conflicts, and also support other services like iCloud. YNAB also offers an iPhone companion app that syncs with the program over a local wifi connection. Syncing is fast, but it would be nice if the app was able to automatically sync using Dropbox or iCloud so that the program is always up to date. I also wish that the software was available through the Mac app store, but the licensing terms are quite generous (only one license is needed per family). My wife and i have been using YNAB for two months now and the results have been amazing. Our expenses have dropped dramatically–YNAB saved us over $350 in the first month alone, paying for itself several times over. Two months in and we have paid off the rest of our residual debts and now have some savings. For the first time in my life I feel in control of my finances. 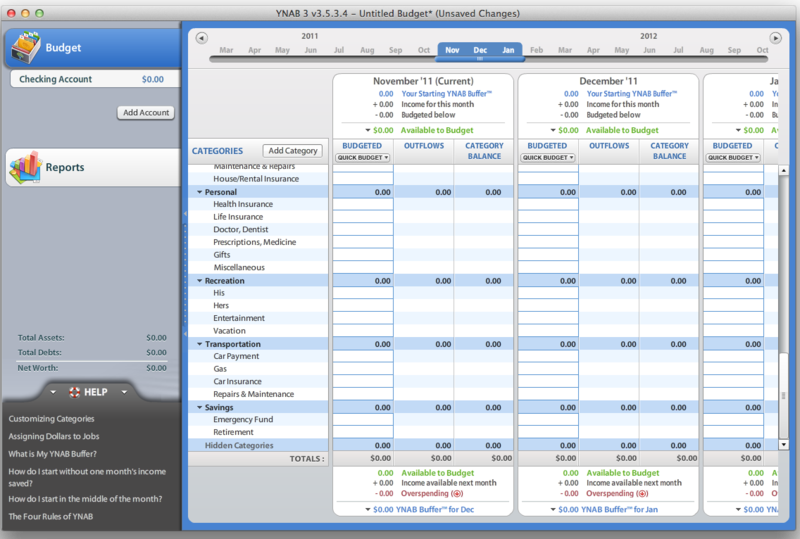 The principles are simple, but YNAB provides the structure and support to help put them into practice. YNAB is one of the few pieces of software that I can say has changed my life. Now the discipline and effectiveness that led to Rockefeller's early success is available to anyone. In Canada there is a chance that using Mint.com will lead to a bank denying you fraud protection (via Money Sense). 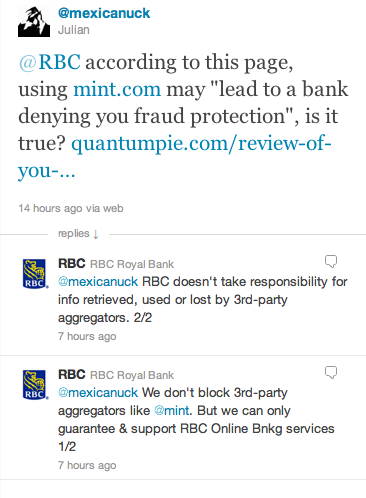 ↩ UPDATE: @mexicanuck asked @RBC if this is true. @RBC confirmed it with this tweet.